Heat the oil in a thick-bottomed pan over a medium heat. Add the sliced onion, and fry for 10 minutes until soft. Add the ginger and green chilli and fry for 1 minute. Add the turmeric, coriander, cumin and chilli powder. Mix well. Add the coconut cream and cook until the oil separates out from the mix. Add the tamarind and coconut milk and bring the sauce to the boil. Reduce the heat and simmer gently for 15 minutes. Meanwhile, shell the prawns (leaving their tails on, if you like) and remove the dark digestive cords. Wash the prawns in cold water and drain them thoroughly. 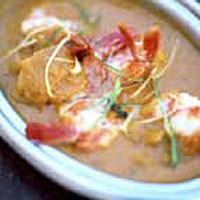 Drop the prawns into the sauce, add salt to taste and gently simmer until the prawns are cooked - about 5 minutes. The sauce should be of pouring consistency. Garnish, if you like, with shredded spring onion, and serve with rice.